While these verses pertain to a broader, spiritual application than some of the change we must manage in the Church, it does provide insight into the change process which involves the mind. 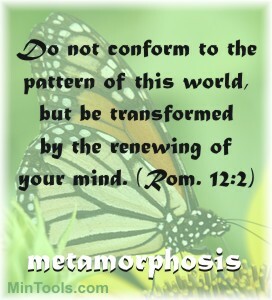 This transformation (same Greek word, metamorphoo) is referenced in 2 Corinthians 3:18 — “And we all, who with unveiled faces contemplate the Lord’s glory, are being transformed into his image with ever-increasing glory, which comes from the Lord, who is the Spirit.” Hence, when we are talking about the renewing of the mind, it is undoubtedly taking us into Christ-like thinking. Our primary objective in any kind of change needs to be about honoring God. Offering our whole being to God certainly includes a willingness to lay down our agendas for His. And, as Romans 12:2 indicates, we need to disengage from the patterns or ways of this world. Let’s remember Jesus’ way of thinking in the face of uncomfortable and even painful change when He said to the Father “not my will, but yours be done” (Lk. 22:42). The first step in acquiring the mind of Christ is to yield to Him because we need His Holy Spirit to teach us (Rom. 8:5-7; 1 Cor. 2:10-16; 2 Cor. 3:18). Otherwise, His ways might seem foolish to us as His ways are not always what we might think is right nor what the world has taught us. Church leaders, if you and the rest of the congregation do not have or are not seeking the mind of Christ when implementing change, you are heading into a field of land mines. Implementing such change could blow up on you at any time, often taking you unaware, and leaving behind a great amount of damage. Look to God regarding changes that should be made. Do not follow after how the world operates or even what other churches are doing. Guide people, along with yourself, in gaining the mind of Christ in whatever the situation might be. Managing Change According to Church Purpose? This entry was posted in Change Management .